I hope you all had a fun weekend!!! 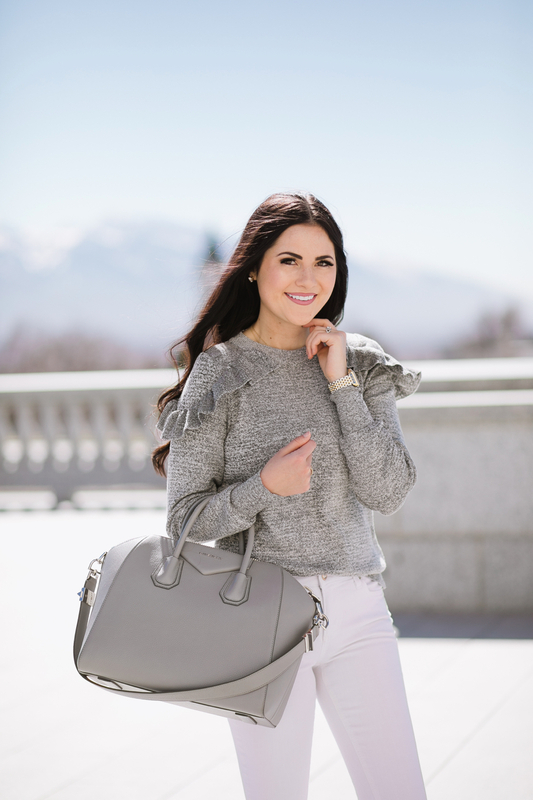 I wore this look last week and I’m kind of in love with the ruffles on this sweater!! Pink and grey has always been one of my favorite color combos, especially for spring time! grey and white is such a nice combination. So fresh, love it! I love your outfit and those Valentino flats are so beautiful! Love how you went with flats for this look…perfectly casual but still a little dressy! Thanks Cathy!! Have a great Monday! 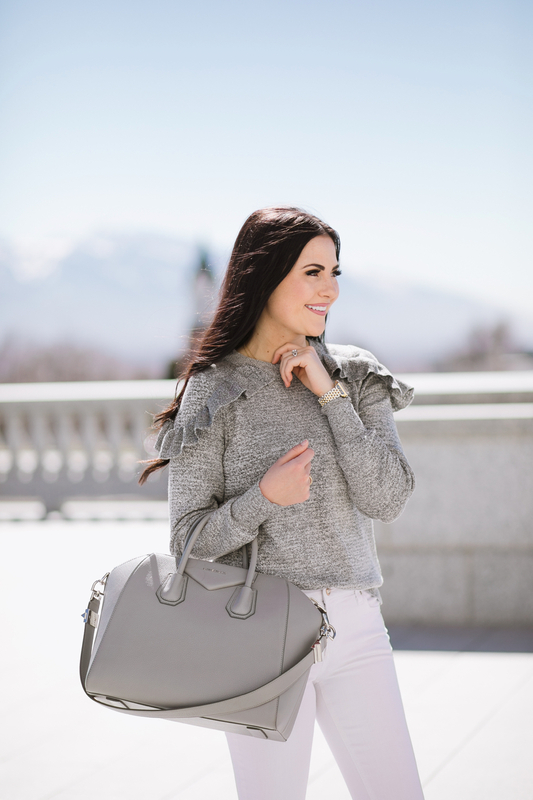 Really love the simple look and the grey ruffled sweater! I love that sweater! The ruffles are so cute! I love that sweater! I actually just got a really similar one from The Loft over the weekend in both black and cream. So much fun, especially as a transitional piece to spring. Oh you did?! I love The Loft! And cream and black would be super pretty! What a cute sweater! I love the ruffle details on the shoulders, as well as the grey color, which makes it a bit more versatile and not super girlie, which I like. I also love grey and pink come spring, I think the soft contrast is both calming and reflective of the season! Thanks for sharing, girlie, and I hope you have a great Monday! Thanks so much Jalisa!! I know, it’s slightly feminine but not over the top. I love it! I hope you have an amazing Monday! Can u please tell me how I order 3 tired pink lace skirt ? You can click this link to purchase the blush tiered skirt from my clothing line: http://rstyle.me/n/cfdcuzjane. Your makeup looks really pretty in these pictures! You are looking fantastic top to bottom in this outfit! LOVE your bag and sweater! Thank you so much Natali!!! You are so sweet! pink and grey is seriously a match made in heaven! We are all obsessing over your sandals from your church outfit on instagram yesterday. Can you share who made them? I love those uneven hem jeans! So cute! Love this outfit! Do the jeans run TTS or did you have to size up, reviews were mixed. Thank you! Beautiful combo! I’m obsessed with those flats! Love it!!!! What size are you in jeans? Trying to see how they run. Also are these white jeans opaque enough so you can’t see if you are wearing something else underneath? Thanks!!!!! I’m a 26 in these jean and they aren’t really see-through. Hopefully this helps!! Cute outfit! Love those flats. I love the shoulder ruffles! So playful yet feminine! Me too!! Such a subtle detail that adds so much to the outfit! I love that even though you own a lot of expensive pieces you wear them all the time and are able to incorporate them into different looks. These shoes and bag especially, they’re amazing and every time you wear them it’s slightly different. Thanks Lex!! I really try to make the most of my investment pieces because I love them so much and hope they never go out of style! I love this outfit! So simple, yet sophisticated and beautiful! I love those jeans, can you please share if they have much stretch and if they fit true to size? Thank you! so cute… i love your outfit’s and the pink and grey combination is very new and unique looking, i really fall in love your outfit’s and the top is very beautiful mainly the ruffle are fascinating look.the photography is ver beautiful, thanks for sharing the posts. Oh, thank you Patricia!! You are so sweet! Your style is amazing sweetness!! Love how you paired the grey on white with those cute sandals!! Love the bag also. I love the ruffle detail on the sweater! Love the details on the shoulders!